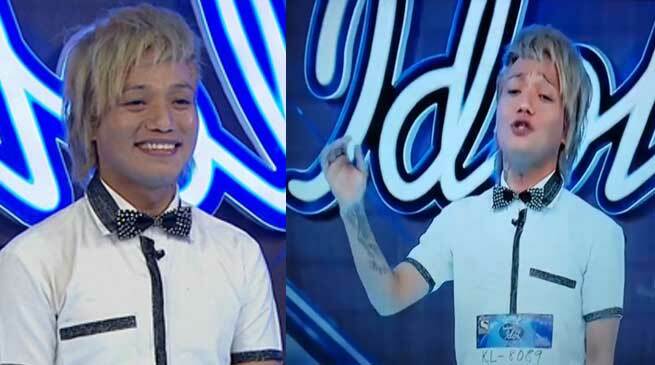 What a huge and drastic metamorphosis indeed for the young singing Star from Arunachal Pradesh Jeli Kayi from performing in small parties, picnics, private parties and other sundry shows to performing on the big stage in front of thousands of live audiences and millions of TV viewers as one of the Top Ten performers in the Season-9 of the popular TV show the Indian Idol. The musical talent show is being judged by out and out professional singers like Sonu Nigam and Anu Malik who can pin-point the slightest technical flaw or aberration in singing. So, the competition is indeed really tough and only those who are technically sound having good musical training backgrounds can dare to participate. Many may think that yours truly is writing about Jeli Kayi after the singer being in the national limelight. But the fact of the matter is that I have known this wonder boy ever since the Voice of Arunachal was held in the state capital, Itanagar in which Kayi emerged as one of the Top Three performers. Since then I have been following the career graph of this young singer. If he is reading this, I may be permitted to add that this is my small tribute to the indomitable spirit and inherent singing talent of Jeli Kayi who lovingly addresses me as Achi (elder brother). I fondly remember that in the midst of the Voice of Arunachal contest, we invited Jeli Kayi as a star performer to perform at Khonsa during a charity music show organized in aids of my nephew Sanwang Hosai who was also one of the participants in the Voice of Arunachal. Even then he impressed everyone with his extraordinary singing, especially his ability to sing in both male and female voice simultaneously. Thereafter, he regularly frequented Khonsa and other places in Tirap district to perform and spread love through the beautiful language of music. Being an anchor then, I became more and more familiar with the young singer. In fact, even today, whenever he participates in any singing competition, he makes it a point to inbox me a small message, asking me for my support that I always do. When the famous singer from our neighbouring state Assam Zubeen Garg came to Khonsa to perform at the Tirap Half Marathon-Run for Peace in 2008, I was asked by the then Tirap Deputy Commissioner Ankur Garg to introduce Zubeen Garg on the stage before a mammoth gathering of music aficionados. I vividly remember what I did say in my introduction of the mega star Zubeen Garg. If I am asked to introduce Jeli Kayi today, I may say the same thing but I may be tempted to add that Jeli Kayi crossed hills and valleys to reach Mumbai by dint of his sheer hardwork and his unwavering determination. He comes from a humble backround that everybody knows. Born in a sleepy and non-descript village in Liromoba in West Siang district the 26 years old Jeli Kayi had great fascination and love for music since the age of 8. He had no scopes, no guides and no musical ambience to pursue his first love; music in a remote village like Liromoba. After doing his early education at Liromoba and Kamba Kayi eventually completed his graduation from the Dera Natung Government College, Itanagar. His stay in the state capital proved to be a boon for the aspiring singer because he got the much-needed exposure through singing competitions and talent hunt contests. Rest as they say is history. Today, Jeli Kayi is a household name not only in the North-East but in the whole country. He has by dint of his strong determination and perseverance established himself as the musical Ambassador of our state Arunachal Pradesh that has produced many sportspersons and achievers in different fields. Jeli Kayi has made the state proud by performing wonderfully well at a national level music show which is being closely followed by millions the entire world over. People like Jeli Kayi build bridges between people’s heart and mind through the universal language of music which is understood loud and clear by all. Talented singers and performing art artistes like Kayi can even change the mindset and misconceptions some fellow Indians living in the metros harbour against the people of the North-East. The other young people of our state should strive to emulate the shining example set by Jeli Kayi to prove their worth to the fellow Indians who often despise and ridicule the North-East people. Win over people with love and by doing exceptionally well in your chosen field. Hardwork is the only mantra. There is absolutely no short cut to success and glory. As the winners in talent contests are finally decided by the votes of the viewers, the people of the state should spare no effort and leave no levity to ensure the victory of their favourite son Jeli Kayi in the mega programme the Indian Idol. The state government is always ready and willing to help all the young talents of the state, be it in sports, academics, dance or music. Apart from the government, the NGOs, organizations and individuals must come forward to help their pride Jeli Kayi to win the coveted title. Thanks to the stupendous success of Jeli Kayi in the national show, the Indian Idol, we can walk with our heads held high. Arunachal Pradesh should be known for all the right reasons and not the wrong reasons.